Candice: We’ve not talked about the new book too much recently. Phil has been busy with his modelling career (!) and I have been busy trying to find myself a new job. You know you need a new job when the thought of going into the office makes you feel physically sick. That plus preparing for the Nativity at school, Christmas Fayre, Homework and all the other fun stuff that comes with being the parent of a school-age child. Anyway, excuses aside, Phil has been more productive than me and I’ve completely lost my mojo. The central theme of the book is a theatre company who needs some help. 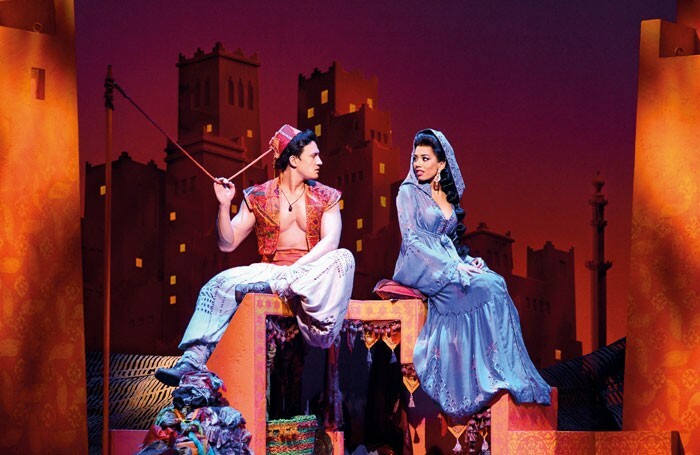 And one of the big shows that they perform is a panto, Aladdin, something that Phil and I both know is important to both funding and crowd attendance in the world of theatre. Phil has written the bulk of the piece. As an expert in theatre after many years working front of house in a local one he knows more about the ins and outs than I do. My experience is more on stage than off (Darlings). But he decided we needed more research into this Panto in particular and suggested a Nolan Parker day out to go and shout “It’s behind you” and “Oh no it isn’t” at some unsuspecting cast in a very British tradition. However, I have scuppered the plan. I’ve taken to going to a Panto once a year for about the last 15 years, after I got given free tickets to see Bobby Davro in one a long time ago and loved it. Some of them are better than others, some of them are ruder than others but all are good fun. We particularly like the ones at the Birmingham Hippodrome which are always more adult and risque. This year, however, the main star of Birmingham’s for many years, John Barrowman, has taken himself off into the Jungle instead for some reason. The In-Laws suggested that we take the small people to one this year. Now I knew that Birmingham would be a no go, and they live down south so we wanted something central. Out of sheer fluke, we’ve ended up with tickets to Aladdin, the show that Phil and I have written into the book. So, when Phil emailed the other day suggesting research, I had to say no as I was already going to see it somewhere else. He’s a bit put out. I think this one will be slightly different experience than the usual as we will be wrangling three fidgeting children and there are no B or C celebs in the one we have chosen. But I will be absorbing the plotline and performance for another reason this year. Do I need to take my notebook? I feel like a cut-price Cinderella – “You shall NOT go to the panto.” Oh yes I do!